I’ll be reading with Matthew Mead at Alwan for the Arts on May 19th. Here are the directions. I’ll be reading from Edward Said: The Charisma of Criticism on the 16th of April at La Pregunta Arts Cafe at 7pm. The address is 1528 Amsterdam Avenue, in front of City College, 2 blocks from the #1 train. Here’s a link to La Pregunta’s Map/Directions on Google. The launch party for Edward Said: The Charisma of Criticism, drew 100+. Many stayed to drink wine and beer and eat fantastic hummus, soujouk, and basturma provided by Anny Bakalian and the Middle East and Middle-Eastern American Center, who went all out hosting the event. A friend flew in from London to see it and posted a nice comment on her FB page: Nouritza Matossian. Then, because she was staying with the German Ambassador Peter Wittig and his wife, Huberta von Voss-Wittig, we all went out to dinner on Monday. The ambassador was reading me book and talked to me about it all through dinner. A couple of additional requests for speaking dates also came in: one at the Rifkind Center at CUNY, the other at La Pregunta bar in Harlem on April 16. Matthew Mead, creative genius, and I are set to do both. We didn’t get a tape of the show. I had a cameraman but there was a mixup and nobody had a webcam. The host Anny Bakalian took some photos with a small camera and has promised to send me some of the shots. People seem to want to know more about the backstory of the book, the anecdotes and personal history that got left on the cutting room floor. The Q & A at the talk was the best one I’ve ever had, in part cause I kept everything personal and told stories. I avoided the more abstract maunderings that any academic is likely to fall prey to. The cross section of colleagues, students, gym buddies, and residents of my building seemed well satisfied with the performance. We sold all the books. Feedback on the book has been enthusiastic. It’s a small book with big print and for that reason is inviting. 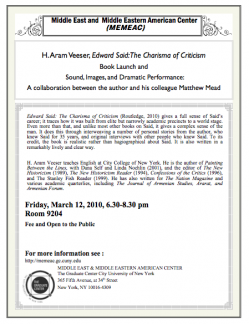 With my colleague Matthew Mead I’m giving this performance on Friday for the launch of Edward Said - The Charisma of Criticism at The Middle East and Middle Eastern American Center at CUNY. © 2010 Harold Veeser. All Rights Reserved.